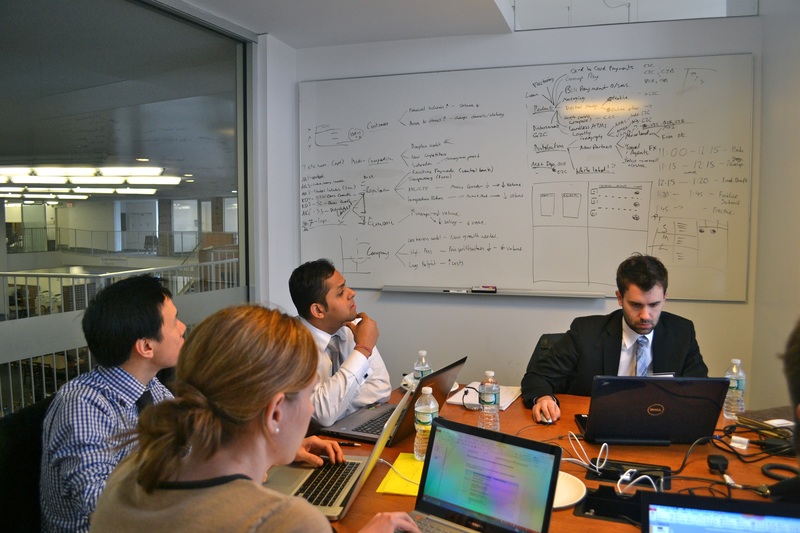 Two weeks ago, my team (Abhinav, Andrew, João, Kristin, and I) embarked on a fantastic, business-school sponsored trip to New York City to take part in the “MBA Odyssey” competition. The “MBA Odyssey” is an annual event for the world’s top MBA providers that is hosted by Columbia Business School. 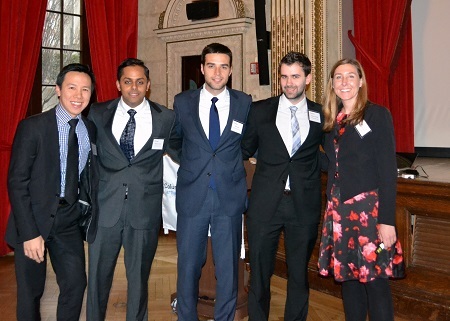 This year’s illustrious participants included: Chicago Booth, NYU Stern, London Business School, INSEAD and HKUST. Unfortunately, Oxford Saïd was not invited to this event, so we had to save the Cambridge Judge vs. Oxford Saïd rivalry for another time. The competition consists of three rounds: an entrepreneurial pitch, a negotiation round, and a strategy case study. We received the briefing for the entrepreneurial pitch a couple of days before the final: the topic was “disruption in the media industry”. This task was especially exciting for Kristin and I, who both aim to start our own companies during the MBA year. Since we were all busy with our MBA Global Consulting Projects, we had to limit our preparation for the entrepreneurial pitch to the 10 hour flight from London to New York and the evening before the competition. Nonetheless, thanks to Kristin’s creativity – she has worked as a product developer for a start up before – we developed an idea that allowed us to confidently look forward to the first competition day. The first day of the event started with a series of high level speakers, such as Neil Glodman, the founder of Capital IQ and David Kidder, the author of “The Startup Playbook”. The actual entrepreneurial pitch took place later that evening. The jury had been relatively tough on some of the teams who pitched before us, so we were fairly nervous when it came to our turn. However, everything went smoothly and we were in high spirits when we went to have beers and burgers with the other teams. We got our results during dinner – we were pleased to finish in the middle of a competitive field with our pitch – and enjoyed an evening in conversation with MBAs from all over the world. The next day started with the negotiations round. We felt especially prepared for this having undergone professional negotiations training with MBA lecturer Mark de Rond as part of our core curriculum. Abhinav, a project manager and columnist for the Financial Times (read his blog here), and I particularly enjoyed Mark de Rond’s negotiation’s workshops, so we took the lead on this challenge. We were teamed up against Chicago Booth and given the task to negotiate a hypothetical IT services outsourcing contract. Thanks to the strategic methods we learned in Mark de Rond’s class, we were able to receive many valuable concessions from Chicago Booth and finished the negotiation with 5,300 out of 6,100 maximum points. This result was the best negotiation outcome of all the teams at the MBA Odyssey event and consequently we were announced winners of the negotiation round! We didn’t have much time to celebrate however because directly after the negotiation round we had to prepare our presentation for the case study round. The case involved diagnosing recommendations to improve the business model of the financial transactions firm Western Union. We learned that other teams had already been working on the case study for several days, so we had to pick up the pace! João used his magical McKinsey-PowerPoint-skills to lead us to develop a comprehensive presentation on a 60-page case study within just three hours. In order to differentiate ourselves from the other teams, we decided to emphasize that we would “provide practical solutions” as oppose to “braindumping a set of generic MBA strategy frameworks.” We also decided to appoint Andrew to present, highlighting his experience as a consultant in the financial services sector in order to demonstrate our credibility. The judges seemed to like our approach and we also got positive feedback from some neutral observers. However, would this be enough for a good placement? While we were waiting for our final result, we met with New York based Cambridge MBA 2014 candidate Akosua. She was full of excitement about starting in Cambridge in a couple of months (rightly so). It is hard to believe that we were in the same position just one year ago – it feels like decades and we have progressed tremendously as individuals since we had to worry about MBA applications and our move to the UK. After two hours or so, we were invited to the final feedback round. We were really excited to hear that our case study strategy had paid off: we finished the case study round in second place! Overall, we finished in 4th position, thereby beating schools such as Chicago Booth, LBS and INSEAD.